Anti Smoking Archives - Build the Brand. Protect the Brand. Recently, R&R Partners created a TV spot for WaytoQuit.org that tested among the top-10 most effective anti-smoking messages nationally. The emotionally jarring spot was extremely effective at inspiring quit attempts, especially among parents with kids. Based on the success of that campaign, we’re now taking the message one step further. Many smokers in Utah are young males without children who don’t watch much TV. R&R needed a message that would encourage quit attempts among this audience, too. Research showed that while many young males don’t have families, they do have pets that they consider family, and that secondhand smoke harms pets as much as it does babies and toddlers. So, the employees at R&R Salt Lake City brought in their various dogs, cats, parrots and rabbits and filmed them right there in the office. Visual effects were then added to show the animals puffing on cigarettes, pipes and cigars. 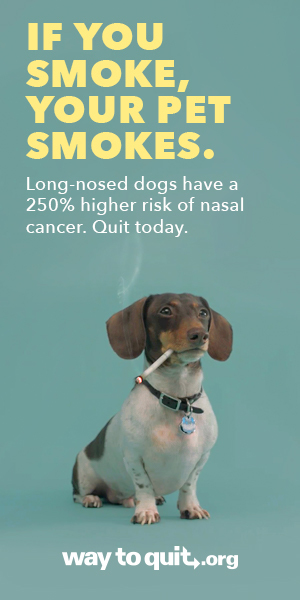 The message was simple, “If you smoke, your pets smoke.” The videos ran on social media and pre-roll. The results have been impressive. 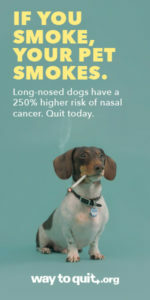 During January/February, the first months that the smoking animal videos ran, visits to waytoquit.org (the website featuring tobacco cessation information) tripled from the same time last year, while time spent on the site doubled. Quit service enrollments, both telephone and online, also increased 30 percent. The videos will be featured at a national tobacco prevention conference.